There's something quite surreal about being able to view the Mediterranean Sea and the mountains of North Africa whilst strapping on your snowboard. The sun beats down on you from above and you squint as your eyes strain from the brightness of the sun reflecting off the snow, whilst at the same time a cold breeze blows into your face. 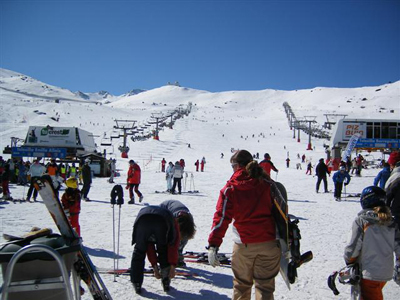 Four thousand vertical feet of snow awaits you as you stand up and prepare to experience the delights of snowboarding or skiing down the Sierra Nevada mountain range in the south of Spain. The combination of sea and snow is what sets the Granada region apart from most other places in the world, let alone Spain. An incredible mix which seems unreal, particularly if a short time before you were stood in the warmth of the lower altitudes of the warmest part of Europe during the winter. The village of Pradallano sits at 2000 metres in height and is the epicentre of the Sierra Nevada Snow Resort. The resort is known little outside of Spain although it is starting to attract a growing number of clientele, particularly the British. This season (2006/07) has been a decent one, especially when compared to the Alps in December and early January. 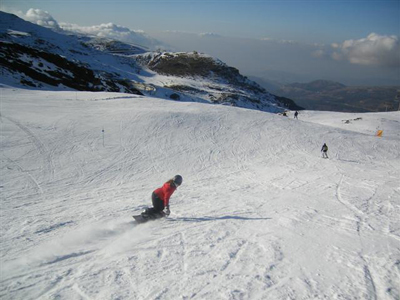 It kicked off on the 3rd December, the slopes covered with a mix of natural and man made snow. With the lifts here topping out at almost 3,500 metres (11,500 ft) the temperatures at this height are guaranteed to be good for snowmaking on any given night. The resort takes advantage of this and the cold nights allow the 428 well placed snow cannons to churn out a regular dose of the white stuff. This made the Sierra Nevada a decent place to ride right throughout December whilst many were bemoaning the lack of snow in the Alps. The odd flurry of natural activity added to the slopes and then Father Christmas decided he would be good to the boarders of Spain, and just before Christmas he let rip with a big dump which made the festive season a real treat for those able to take advantage of the conditions. In resort the park builders did a top job carving out kickers and placing rails to create a big area for boarders and skiers to have some fun. Some of the top riders in Spain ply their trade here and there is a great variety of jumps allowing riders to progress their skills. The resort is a lot bigger than most people envisage with 87km's of piste and 23 lifts taking the hordes of boarders and skiers around the six different areas of the mountain which make up the Sierra Nevada Snow Resort. The slopes are ideal for beginners and intermediates and there are still plenty challenges to be found for the more advanced, particularly after a good dump of snow. February brought the next noticeable snow fall and boosted the slopes at the right time. This was also the first time to get any semi decent off-piste boarding going during the season. It snowed on and off for almost a week and with the sun shining in between it was a great time for the resort. The start of March brought more snow and for the first time the Laguna De Las Yeguas area was officially opened. The conditions were fantastic and the early birds who made their way to this part of the mountain got a real treat. Hiking is an option for the extreme snowboarder or skier in search of adventure and the slopes above the Laguna De Las Yeguas are particularly steep although they are prone to avalanche and can't be taken lightly. The pisted options on this part of the mountain are also very good with and lots of places to go off-piste on terrain that isn't as extreme as the mountainsides above. 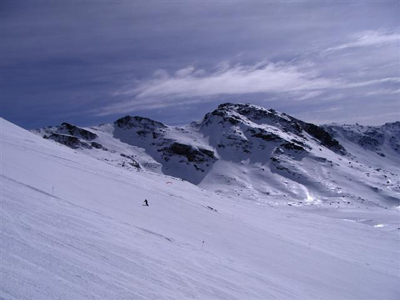 The Sierra Nevada is the most southerly ski resort in Europe and also the sunniest. This makes riding here a very pleasant experience particularly in the afternoons. It is a very social resort and the Spanish certainly know how to mix relaxation and riding to create a fun place to hang out. In the resort the cafes and bars have a great atmosphere and are very lively at night, especially on the weekends or during a Spanish holiday. The only down side to the Sierra Nevada can be the sun! Any droughts of the white stuff and the lower slopes can become soft and a little slushy at times. This only seems to affect the very bottom runs though, and in general the mid to top pisted runs were in decent condition throughout the season. The mid parts of the mountain around the Borreguiles and Rio Monachil are accessed via a gondola and are very popular. This is where most patrons hang out and this area can get crowded. A few cafes and shops and a collection of chairlifts and a beginners' carpet provide a great place for people to ride and hang out in the sun whilst enjoying the views all the way to the top of the resort. The cafes here are also a great place to work on your tan! The Ladies' World Cup skiers came to the Sierra Nevada at the end of March and a little snowfall just before they arrived brought good conditions for the very successful event. So, here we are in April now and just when we thought about winding down the heavens opened and the best snow of the season arrived with a bang. The slopes have been getting regular and heavy snowfall for the last two weeks and this has opened the entire mountain for riding. The off piste has been awesome especially if you get up on a blue sky day after a few days of snow. It doesn't matter where you are in the world, you just can't beat the feeling of freshies in the morning. The bad news is the resort has just announced that the slopes will officially close on 22nd April and bring to an end a decent season which has finished on a high. There have only been 4 or 5 days since the beginning of December when the resort wasn't open due to the weather (high winds). The slopes of the Sierra Nevada will never compete with Alaska for snow or the Alps for terrain size but then again it has never tried to. Anyone who comes here is pleasantly surprised with what the area has to offer and despite the Spanish trying their best to keep it a secret, word is slowly spreading about how good it is here. Big plans are afoot here and in 2010 a new Gondola will take people from the centre of Granada city up to the slopes in twenty minutes. Standby to see Granada well and truly on the "where to go" map when that happens. The resort is a place growing in size and stature and when this is able to be combined with the incredible sights and nightlife of Granada city the place will take off … come and sample it for yourself.